The Boeing 787-8 Dreamliner project was aimed at improving the systems and cockpit of the old Boeing 787. Initially undertaken by Omega95 and Redneck, the project led to a major overhaul and redevelopment of the predecessor model, with only the main aircraft model and liveries yet to be modified. An interesting change and key feature of the new model is the impementation of a new Flight Dynamics Model based on the JSBSim. This was created using much data from -- the Piano tool. Other interesting new features include the development of a 'cool' glass cockpit with highly detailed Boeing 787-8 instruments; and many advanced systems such as the Hydraulics, Pneumatics, Heating, Fuel System and Fly-By-Wire functionality. The first trace of the project on the forum was from the development of the Boeing 787-8's CDU and since then, it has turned into a community project. A lot of developers and forum users have contributed to make this successful. Another key feature is that whenever findings or innovations have been made, they have gone on to the forum and soon, a lot of wiki HowTo tutorials have been created so that these may help other developers too. 6 Aircraft of the month! A new Control Display Unit (CDU) specifically built for the Boeing 787-8 replaces the generic Boeing CDU and lets you control many of the configurations and settings on the aircraft like VNAV Cruise Settings, the flight plan (with VNAV altitudes,jump to, activate and remove features), Fly-By-Wire Configuration, Departure/Arrival Settings, Electronic Flight Bag (EFB) input etc. The forum topic for the Boeing 787-8 CDU development can be found in this forum topic. A Vertical Situation Display  is an instrument, part of the Navigational Display (on the MFDs) that show the aircraft's Vertical Navigation Altitudes, Vertical Profile and projects the terrain in front of you. In the Boeing 787-8, it shows approaching terrain for up to 50 miles and also color codes the terrain regions on the basis of danger (red - increase altitude immediately; orange/yellow - advisory; white - safe). The view the Vertical Situation Display, go to the NAV page on any of the MFDs. Note that the VSD is not available on the full-screen ND (NAV page on 2 adjacent MFDs). The VSD is uses a series of Nasal and XML files (which some core developers make like to call 'Hacks') to get functionality of hard coded instruments. The Boeing 787-8 features a new Navigation Display (ND) which features the ability to plot the waypoints and connect them, like in the real ND. User:zakalawe has been working on a hard coded version of such a display but as we didn't get it at the time, we designed this instrument completely with nasal and XML interactions. Another feature on the Boeing 787-8 is the ability to show a larger Navigation display when both pages are set to NAV on the co-pilot's side MFDs. The larger full screen MFD shows more waypoints and the range can be adjusted between 1 nautical mile and 250 nautical miles. It also shows the airport diagram of the nearest airport positioned and rotated in the right configuration and can be seen better when the range is less than 10 nautical miles. Another feature of the Boeing 787-8's Navigation Display is a very functional TCAS (Traffic Alert and Collision Avoidance System) which has also been designed completely in Nasal and XML and does not require wxradar to work. The Electronic Flight Bag (EFB) as the name says is like an electronic database of handy documents and charts. The Electronic Flight Bag on board the Boeing 787-8 can calculate the required amount of fuel for your flight, show any airport's (you can search using the EFB INPUT page on the CDU) information, like elevation, metar and runway information like heading, length, ILS frequency), connect to Virtual Star Alliance's Automatic PIREP System for more functionality, connect to Redneck's FGFSCopilot for logging, show the GPS settings (your position on the world map, course and true headings to your next way-point and distance to your next waypoint. It also has realistic checklists for every phase of the flight, and an operating manual explaining basic maneuvers. You can also "INSTALL" airport diagrams and charts into the '/787-8/EFB-DB' folder which allows you to view them on the CDU (searchable using the EFB INPUT page on the CDU). > Download diagrams from any source, convert them to *.jpg format and rename them '<icao>.jpg'. Then, place them in the EFB-DB folder. Then, use the 'EFB INPUT' page on the CDU to enter the airport ICAO and it displays the diagram on the EFB. Now, rename your *.jpg file to the chart name (eg. 25L-ILS.jpg) and place it inside the '/EFB-DB/Charts/KLAX/IAP/' folder. Click on the button next to the 'Chart ID (select)' label to cycle through available charts. Now, hit the 'DISPLAY >' button on the CDU and look at the EFB to see your chart. Note that for some charts, the orientation may be land-scape and not portrait. But to overcome that, I've put a 'ROTATE' option on the EFB which rotates the chart when you click it. The Above has been taken from the forum topic. The Electronic Flight Bag is also meant to provide and interface third-party and/or operating airline softwares. These are not present in the Flight Management Computer by default but we're working on a couple of softwares for the EFB. This is not unrealistic because this is one of the main purposes of the Electronic Flight Bag. 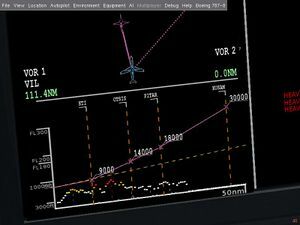 Here're the softwares we're working on for the EFB. The FGFSCopilot is a java program that can do almost everything required from taking off till landing the plane at your destination. The Boeing 787-8 has an FGFSCopilot Log page in the EFB which shows it's connection status and every log message the FGFSCopilot sends to FlightGear. 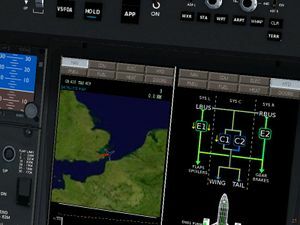 The VNAV AutoGen is a third party software on the EFB that automatically calculates ideal vnav altitudes for the active route. To use it, simply create/load a flightplan, copy it to the active route, go to the VNAV Altitudes Gen page on the EFB and click on AUTOGEN >. That would generate altitudes for you which're displayed on the EFB. You can scroll through the waypoints using SCROLL UP > and SCROLL DOWN >. Finally, if you're happy with the automatically generated altitudes, click on COPY TO RTE > to move them to the active route. 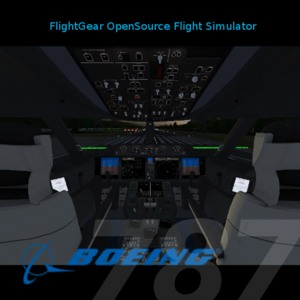 The Boeing 787-8 Dreamliner is FlightGear's first Airliner to feature a complete Fly-by-wire system. The idea behind this fly-by-wire is to get it the pilot's controls (/fdm/jsbsim/fcs/x-cmd-norm : where x can be aileron, rudder or elevator) and work with it and give out another output property (/fdm/jsbsim/fcs/x-fbw-output) which is read by the FDM and control surface animators. The throttles don't have a chain such as the other surfaces so that the pilot can easily override the fly-by-wire (one of Boeing's "philosophies"). At this stage, the fly-by-wire can protect the aircraft from extreme bank angles (flight envelope protection- roll) where the bank angle limit can be set by the pilot in the CDU's 'FBW CONFIG' page, protect the aircraft from extreme alpha angles (flight envelope protection- alpha), calculate the throttle required and set it accordingly to maintain profile on turns, reduce throttle to stay under limits and finally auto-stabilize the plane and maintain the current profile when the yoke is brought back to the center. The Fly-by-wire also dampens the control to prevent any sudden motion. Fly-by-wire can be toggled from the CDU's 'FBW CONFIG' page. NOTE : To be able to activate alpha-protection, roll-protection and auto-stabilizer, you need to be atleast higher than 3500 feet. 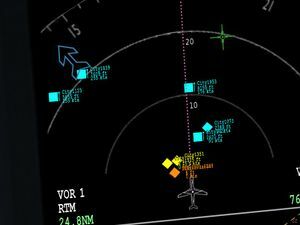 This is so that the fly-by-wire doesn't interrupt your approach. I've seen a lot of wiki pages on aircraft autopilot and always noticed that next to 'VNAV -' the author writes either he doesn't know what it is, or it doesn't do anything or he hasn't tested it yet. Well, for a change, here I'm telling you what the VNAV does. You doesn't have to enter altitudes for WP5 to WP10 because you'll start cruising at WP5 (say you want to cruise FL360 aka. 36000 ft) and stay at 36000 ft till WP10. That means WP11 will be your 'End Cruise' Waypoint, where you aim at when you're out of the cruise. To set cruise settings, go to the CDU's 'VNAV' page and enter cruise altitude in the respective area. Then enter your cruise start altitude (in this case, WP5) and cruise end altitude (in this case, WP11) in their respective places (there're labels). Once you're ready, finish other checklists, take off and turn on 'LNAV' and 'VNAV' on the Autopilot. The VNAV is designed to automatically calculate the required/ideal climb/descent rate to get to your waypoint just in time. Out of all the tests we've conducted, the VNAV is VERY accurate at the moment. In the Feb 25th, 2012 git commit, a new flight-plan management system has been written for the Flight Management Computer(s). The new system, like the real one lets you put in 2 flight-plans (with altitudes), and an alternate airport. You can do everything that you can to the route manager on these 2 flightplans. Boeing likes to call them Primary Flightplan and Secondary Flightplan. Once you enter your primary and/or secondary flight-plan, the respective flight-plan's status will show READY on the flight-plan management page. Then, a new option, COPY TO RTE will appear under the respective flight-plan and on clicking that, that plan will be moved to the active route. To make any changes to the route, you can either make them to the flight-plan and copy them to the route again or simply work with the active route by clicking on the ACTIVE ROUTE option in the Flight-plan Management page. An alternate airport is recommended to be entered in the CDU so that in case there's a problem during flight, the plane can be automatically be diverted (by the FMC) without you having to do anything other than pressing the DIVERT option on the Flight-plan management page. Note that using the DIVERT button to divert to your alternate airport clears your active route and sets the aircraft on a direct flight to the Alternate Airport. The Boeing 787-8 now features an automatic holding pattern system where you enter the hold fix/navaid, hold radial and hold leg time and the aircraft automatically flies in a holding pattern there. (as described in real Instrument Flight Rules Rating Course (IFR) textbooks) This feature is still being developed at the moment and is not perfected, but it still does the basic thing for you. 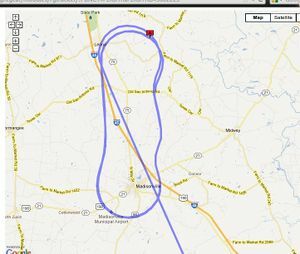 We have tested this feature from KIAH (George Bush Intercontinental Airport, Houston) holding at the VOR, LOA (LEONA VORTAC, about 70 miles north-west of KIAH) at a hold radial of 0, and hold leg time 120 seconds. We've been able to hold and re-trace the hold path every lap, but we get a strange shape due to the pid-controller. We're still working on it. 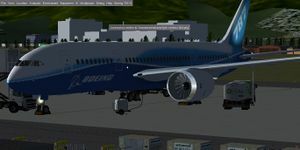 The Boeing 787-8 Dreamliner (as of February 21st, 2012 on GIT) features a brand new TCAS (Traffic Alert and Collision Avoidance System) which has a capability of showing 30 Multiplayer aircraft and 20 AI Aircraft on it! Now, you won't have to complain about not seeing all aircraft on VATSIM ;) We're still working on increasing it's capability to 50 each multi-player and AI. The TCAS has 3 different symbols for each aircraft and 4 different color codes. Each aircrafts' callsign, altitude and true airspeed will also be written next to the sprite. The Diamond Shaped Aircraft sprite shows that the aircraft is flying level. The Box with Up Arrow shows that the aircraft is climbing. The Box with Down Arrow shows that the aircraft is descending. A Cyan or Blue Colored Sprite shows that the aircraft is at a safe distance. A Yellow Colored sprite shows that you need to be aware of traffic nearby. A Orange Colored sprite shows that you need to either change altitude or course, consult ATC. It is an advisory. A Red Colored sprite shows that you are in danger and immediately need to follow the TCAS instructions. The TCAS is configured to sound voice alerts according to the situation. The TCAS voice alerts needs to be followed over the ATC's instruction if they contradict. The TCAS will alert you if you are in danger of collision with MP or AI Aircraft. 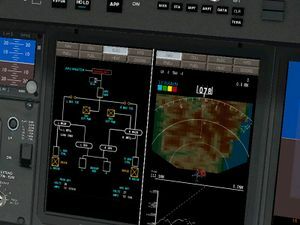 NOTE: The TCAS voice alerts have been confirmed working on FlightGear git (2.7, as of February 19th, 2012) but don't seem to work in FlightGear 2.4. 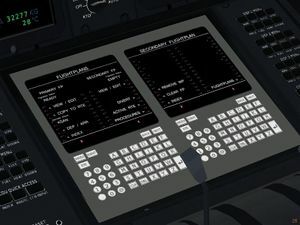 The Boeing 787-8 Dreamliner (git version as of February 21st, 2012) features a terrain radar which creates a terrain map on the MFD when the Navigational Display is set to TERR mode (you can change the mode from the buttons on both sides of the Mode Control Panel). Click on WXR to view the WXRadar (Collins WXR-2100), TERR to view the Terrain Map and CLR to clear the ND. The weather radar is still under development and a working version is not available, but the terrain map uses a 'get little and interpolate' method to create smooth terrain mapping. Another option to put on the ND is the world map. It's not exactly a terrain map, but rather like satellite imaging. The plane is shown (it's zoomed in) on the map and the plane's path is marked with fading red dots. You can get your ND to show the satellite maps by pressing the WMAP button on the ND mode panel. Note that you can have any 1 of WXR, TERR or WMAP on and to remove them, press the 'CLR' button. The Boeing 787-8 Dreamliner is an Airliner and we can't leave out some of the key features airline manufacturers put in their aircraft. There're 2 major sections in the Flight Management Computer (it's a part of the CDU) - the ROUTE and DEP/ARR. Both pages are accessed from the CDU(s). The Route is directly connected to the Route Manager and doesn't do anything 'special', but the DEP/ARR page lets you work with preset routes, SIDs, STARs, IAPs etc. You can enter the flight number (this is meant for virtual airlines: By default, Merlion's Boeing 787-8 Routes are included in the Database but I'll make a tutorial on how other airlines can put in their data) and be able to search for the flight information. If the airline has specified a Route and/or VNAV Altitudes and Configuration, you can load up those preset routes and altitudes by pressing the 'SET ROUTE >' menu. If a preset route doesn't exist, the FMS will generate a route automatically. A pilot does not have to worry about preset/generated routes. Another feature in the FMC is Scott Hamilton's LevelD-767 NAVDATA Parser, which gets SID/STAR/IAP Data and automatically puts them in the right place in the route manager for you to be able to fly them. This data can be managed from the PROCEDURES option in the DEP/ARR page. We'll also be creating a video tutorial (Dreamliner Tutorial #6) on the Flight Management Computer. 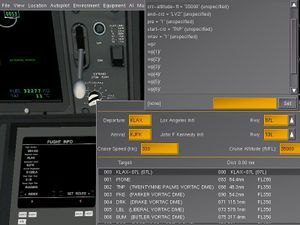 The Boeing 787-8 Dreamliner and the Airbus A380 (being developed by Scott Hamilton) uses Scott's Level-D 767 NAVDATA Parser to get Navigational Data and Terminal Procedures into the aircraft's Flight Management Computer (Flight Management System on the A380). The FMS Data must be downloaded separately. 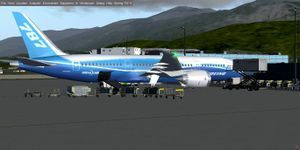 By default, the 787-8 contains navigational data for the following airport - WSSS, YBBN, KLAX, KJFK, EGKK for testing purposes and as the Flight Management Computer Tutorial is a flight from KLAX to KJFK. The capabilities provided by this aircraft touch many parts of FlightGear, that will benefit from modifications to the C++ code, this is an attempt at documenting useful C++ work. Most of this should probably be posted to the issue tracker, too. The Aircraft doesn't 'yet' have a camera/video surveillance instrument but the team is working on it. We are creating a Wiki Howto: Use a Camera View in an Instrument while working on it so our progress can help other aircraft developers. The basic idea is the render the camera view to texture and get flightgear to display it on the instrument. As this instrument includes work in C++, it will NOT be available in FlightGear 2.4.0 or 2.6.0, and not even git at the moment. 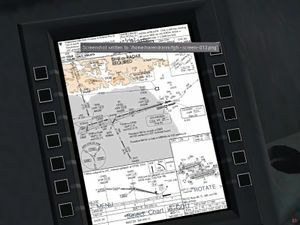 Also see Howto: Create a 2D drawing API for FlightGear. Fix geodinfo() so that it may provide access to tiles not yet loaded, i.e. tiles that are not "visible" (which is the limiting factor currently). This will also be useful for the local weather system and probably a number of related scripts. The tile manager is capable of satisfying multiple requests. Anyone can give it a position, range and a timeout. It will then try to load all tiles in the range specified. And it will stop loading them after the timeout - unless you have updated the request with a new timeout. So you could tell it every 5 seconds that you're interested in a certain area around the aircraft, and use a timeout of 5,01 seconds. A matter of memory and loading speed though. The Boeing 787-8 Dreamliner has a very complete and realistic modern glass cockpit based of the real Boeing 787-8 cockpit. Almost all of the instruments (excl. Weather radar which is currently coming up, and the voice comm.) are functional and work like the real thing. 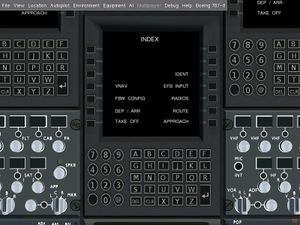 Multiple views have been created (like the OHP, CDU, EFB, Full Cockpit Views) so that pilots can easily work on different parts without looking away and adjusting view position. That's all I can say about the cockpit now... You better test it out to judge it. Ram Air Turbine (used in case of dual engine failures to provide just enough power for Central Hydraulic Systems (C1 and C2) and Instruments. To Understand the Electrical System better, take a look at the 'ELEC' page on any of the MFDs on board. The Hydraulic System on-board is very advanced and does the job it's supposed to do. There are 3 basic Hydraulic Systems - Left Engine Hydraulics, Right Engine Hydraulics and Central Electrical Hydraulics. Both Left and Right Engine Hydraulic Systems are pressurized by Engine pumps which require the engines to be running. These pumps pressurize the L and R systems that are connected to the flaps, spoilers, brakes and landing gears. Therefore, you need atleast 1 of the 2 Engine pumps to be running to be able to use these. But, the landing gear has an 'alternate gravity drop system' which you can use to get your gear down in case of a hydraulic failure. The Central System has 2 electric pumps that control pressure to the hydraulic system that controls the ailerons, rudder and elevators. Only 1 of the 2 pumps have to be turned on at a time, and the other can be used as backup in case of a failure. The hydraulic pumps can overheat and fault if not adequately cooled, refer to the 'Pneumatics and Air Conditioning System' for more information on this. To Understand the Hydraulic System better, take a look at the 'HYD' page on any of the MFDs on board. The Boeing 787-8's pneumatic and Air-conditioning system controls bleed and flow of air through packs (and trim) which are then used to cool the equipment on board. The pneumatic system is pretty simple, you have 2 packs, 2 trim air controls, a gasper, and engines and APU bleed. The 787's systems automatically control bleed according to what is required and available, but you'll have to control the trim and packs. Equipment Cooling is an option on the Pneumatics panel which passes cool air into the hydraulic and fuel pumps to prevent them from overheating. When a pump overheats, you get a warning and if you do not either turn it off or switch on equipment cooling, the pump can fault. The 'PNEU' page on the MFDs show you more information on equipment temperatures and Pneumatic settings. The Fuel Control System let's you control the 7 fuel pumps on board the 787-8 Dreamliner (2 Left Tank Pumps, 2 Central Tank Pumps, 2 Right Tank Pumps and a Crossfeed pump). The left tank and central tank pumps pump fuel from these tanks to the left engine, while the right tank and central tank pumps pump fuel from these tanks to the right engine. In case of a fuel imbalance, you can turn on the crossfeed pumps to transfer fuel from the tank with excess fuel to the one with low fuel. The Aircraft has a complete fuel jettison system where you can select which wing nozzle to jettison from, arm jettison and use a knob to define the dump rate. If the Left Nozzle is activated and Fuel Jettison is armed, you dump fuel from the left and central tanks, and the same for the right nozzle. Note that the 787 will NOT let you dump fuel if you have less than a critical value. Ice starts building up on the windows if temperature is sub-zero and window heating is turned off. The Heating System on board controls 4 different heating equipment. First of all, let's get into "natural icing". If your TAT (Total Air Temperature) value is under 10, your wings, engines and wind shield can start picking up ice. Window Ice simply forms on the window and obstructs your view out of the cockpit. Whereas, wing ice actually affects your lift and drag in the FDM! As for engine ice, if you have extremely high amounts of ice, the engines can fault and you might have to cool and then restart them. Note that Engine surges are NOT due to ice build up. If you get an engine surge while flying, you might either be flying over Vne, or in extreme weather conditions with N1 above safe limit in those conditions. The Window Heating switches on the overhead panel enables a heater to start melting the ice on the windshield letting you see outside clearly. The Anti-Ice knobs (2 engine knobs and a wing anti-ice knob) let you control the heating equipment on the respective areas. The 'HEAT' page on the MFD should have more information on the Heating Systems. The Boeing 787-8 dreamliner has 3 retractable gear units, the nose gear has 2 tires, and the main landing gears have 4 each in a square layout. The gear system manages gear compression and failures (stuck, tires burst and break off) on the basis of airspeed, wow and compression. The gears system can be monitored from the 'GEAR' page on the MFD(s). 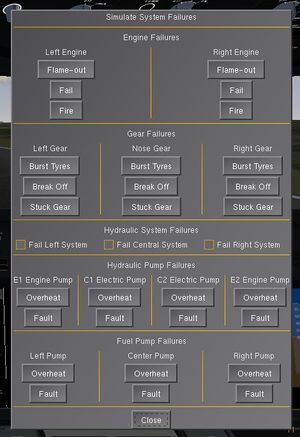 The fuel truck (MENU: Boeing 787-8 > Fuel Truck Controls) can be enabled/disabled and connected/disconnected from the aircraft's fuel value under the wing. You can enter an amount of fuel in the request fuel quantity input and ask the truck to re-fuel the aircraft to that quantity. You can also ask it to drain the fuel tanks. 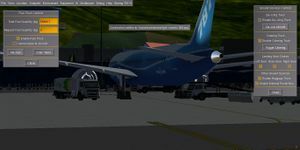 The de-icing truck along with the other ground services can be controls from the Ground Services Controls menu (MENU: Boeing 787-8 > Ground Services Controls). The de-icing truck can be enabled/disabled and you can also de-icing the aircraft. The de-icing process includes the truck animations and actually de-icing the aircraft! The External Power box is a stand-alone generator that provides external power to the aircraft. When enabled, it is connected to the external power socked under the aircraft's left wing. Note that this needs to be enabled so that you get external power. When you start FlightGear, the external power will be enabled by default. Landing Gear chokes are triangular prism shaped blocks that're placed in front of and behind the landing gears to prevent the aircraft from moving. These chokes will also prevent the aircraft from moving in FlightGear and are enabled by default on start up. Note that to get the aircraft moving, you need to remove the parking brakes and chokes. The catering truck can be enabled/disabled and toggled. The Toggle Catering option is to lift/lower the catering box and connect to the the R1 Door. It doesn't do anything else. These're just models and don't do anything at the moment. Other general failures like Electrical, Static etc. have not been implemented in this dialog as they can already be controlled with FlightGear's Generic System Failures dialog. NOTE: When you flame-out an engine, it can be restarted, but not in the case of a failure. Faults just means that the pump is too hot to function, but it can be restarted when cooled. In case of an engine surge, (this cannot be toggled by user as it requires certain weather conditions and N1 to occur) immediately reduce throttle and get the N1 under 65%. If you're flying too fast, try to slow down and avoidance extreme weather (heavy rain and snow) would be a nice idea if you want to prevent surges. Johan G posted in the Boeing 787-8 Dreamliner Forum Topic: I really see why there could be a real need to have a copilot along when "flying in" the aircraft during pilot conversion. Basically, the systems are very complex that it might be difficult for just 1 person to control the plane and manage the systems. As an immediate solution, the virtual copilot can announce ref. speeds, control flap lever, control gear lever, control heating and pneumatics, set altimeter setting and engage thrust reverser's and spoilers on touchdown. You can select exactly what you want him to do in the Virtual Copilot Settings Dialog. On the other hand, we're working on a new advanced dual control system which allows the copilot to completely control the aircraft and see all instruments over multiplayer. See the Aircraft/787-8/ directory in FGAddon. Thanks to Oscar  for the amazing Aircraft of the Month Review Video for the Boeing 787-8 Dreamliner. We don't have more detailed test results. so we can't test everything yet. Once we get that, we need to tune the FDM further. The Aircraft has very advanced systems imitating realistic systems from the real 787. Random/Checkable Failures purposely haven't been implemented as random is never realistic. But Engine failures, ice etc. occur in the appropriate conditions. The 787-8 has very advanced instruments, flight management computer, hydraulic, electric, pneumatic, heating, fuel etc. systems. The cockpit is very detailed and most buttons are there and functional. The instrument displays are very advanced and functional, the ND could be replaced by a hard coded version though. A Camera View instrument is supposed to be there but isn't, but we're working on a hard coded camera view instrument. The aircraft uses textures extracted from pictures and ambient occlusions created with blender. The complete cockpit has been light-mapped and looks very good at night too. The model is still from the old 787-8, there's the basic model without a cabin, rods aren't yet complete either. The landing gears have been re-done and look a lot better now, but the model has a much better scope of improvement. 787-8 Summary Sheet. Published by Department of Aerospace Engineering, University of Bristol. "Air Force HSI". Published by Wright-Patterson Air Force Base. AERO Quarterly. Published by Boeing. ↑ Brehm, Thorsten. "FlightGear-devel mailinglist". Collins WXR-2100 MultiScan™ Radar Fully Automatic Weather Radar. Published by Rockwell Collins. Evans, James E.; Weber, Mark E. (2000). "Lincoln Laboratory Journal". This page was last modified on 2 September 2018, at 18:26.